Honest, mutual trust with skaters and parents through good communication. Strives to bring her skaters to the top of the world. 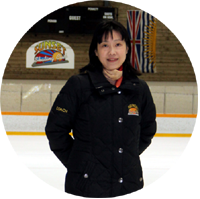 Coached in China for 9 years before moving to Vancouver in 2006. Has been coaching in Vancouver since 2007. Graduated from Shenyang Sports College, BA, studied figure skating for 6 months in Omsk Sports Institute, Russia; Attended ISU Judges /Specialist seminars. Jennifer has had skaters passed all levels of tests from Pre-preliminary to Pre-Novice, Novice, Junior and Senior tests since she began coaching in Canada in March 2007.